Red onions, sometimes called purple onions, are cultivars of the onion with purplish red skin and white flesh tinged with red. These onions tend to be medium to large in size and have a mild to sweet flavor. They are often consumed raw, grilled or lightly cooked with other foods, or added as color to salads. They tend to lose their redness when cooked. Red onions are available throughout the year. The red color comes from anthocyanidins such as cyanidin. Red onions are high in flavonoids. They can be stored 3 to 4 months at room temperature. The red onion from Turda (Cluj County, Central Romania) (Romanian: "Ceapa de Turda") is a local variety of red onion with light sweeter taste and particular aroma. The area of cultivation encompass the lower Arieş valley and the middle Mureş valley. Turda onion bulbs are traditionally intertwined into long strings (1–2 m) for marketing purposes and can be found at the traditional markets all over central Romania. "Turda Red Onion" is usually served fresh, as a salad or part of mixed salads and especially as a compulsory garnish for the traditional bean-and-smoked ham soups. Red onions helps by not getting a heart attack or cancer. They are used as a medicine. They are treatments for colds, diarrhea, intestinal parasites, gallstones, and rheumatism. The red onion from Tropea, Italy, (Italian: "Cipolla Rossa di Tropea") is a particular variety of red onion which grows in a small area of Calabria in southern Italy named “Capo Vaticano” near the city of Tropea. This onion has a stronger and sweeter aroma and the inner part is juicier and whiter than other red onions and it is possible to make a marmalade with it. In March 2008, the European Union registered the Protected Designation of Origin mark for the onions produced in this particular area. I usually don't make scalloped potatoes like this, but I thought I would change things up a bit. My family loved this. 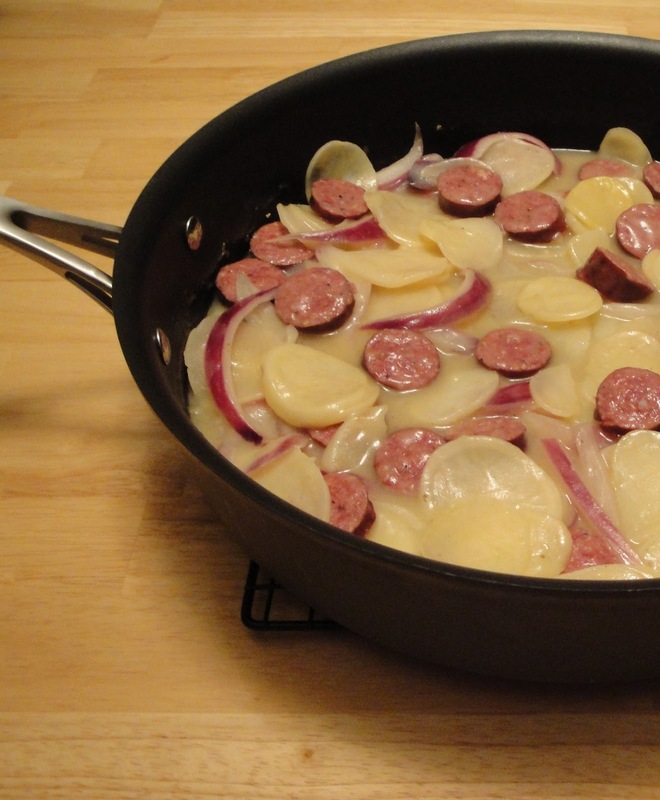 In large skillet, add hot water, butter, chicken broth, potatoes and potato seasoning mix. Stirring occasionally, bring to boil. Stir in sausage, covered and simmer for 20 minutes, stirring frequently. Stir in red onion, cook another 5 minutes or until potatoes are tender. Sauce will thicken as it stands. Enjoy! Now that is something my son would love! Have a great weekend, Christine. I've never had scalloped potatoes with sausage. Thankfully, I threw a long sausage into my shopping trolly tonight without a plan for it, and now I have one! My husband would adore these potatoes! Thanks. I love potato dish, this sounds easy and wonderful, Christine! Love red onions! Also love potatoes and sausage. All three together sound yummy to me! This looks really good--I love the bit of color from the red onion! looks really yummy Christine! and simple too! My husband would love this idea! Sounds very delicious! Hey Christine, Cooking lady here this is one of my comfort foods. Yummy! Think I fix this tomorrow with some andoule sausage.